Field proven with hundreds of systems in operation worldwide, the Silhouette™ represents the state-of-the-art in central receive antenna systems. All central receive systems are not created equal. Broadcasters and law enforcement agencies worldwide rely on NSI Superquad™ and Silhouette™ central receive antenna systems for electronic news gathering (ENG), airborne low enforcement (ALE) and other live event applications. Compatible with single-input receivers as well as diversity receivers, the Superquad™ and Silhouette™ represent that state-of-the-art in central receive antennas. They provide critical performance advantages to maximize the area of coverage and to ensure robust digital live shots. In addition, they are built to ensure years of reliable operation with minimum maintenance. The Superquad™ and Silhouette™ incorporate important characteristics that are essential for superior performance - high gain, directivity and selectable polarization - to isolate the microwave link from interference and to provide the maximum area of coverage. The dynamic range of the LNA and block downconverter (BDC) has proven to be a critical determinant in maximizing the area of coverage for digital shots. Modern LNA/BDC designs have little difficulty handling low signal levels, as found in a distant shot. However, a high signal level from a transmitter close to the central receive site can saturate the LNA and/or overload the receiver, which will cause a digital shot to fail. Superquad™ and Silhouette™ central receive antennas feature a unique LNA/BDC assembly with a continuously variable level control to ensure the robustness of live shots from practically underneath the antenna out to the radio horizon and everywhere in between. The Automatic Gain Control function of the NSI MC5 remote control automatically optimizes the LNA/BDC level to maximize the RSL without overloading the receiver. One of the hallmarks of an NSI product is the way it is built. The Superquad™ and Silhouette™ are designed to ensure years of reliable operation with minimum maintenance. They incorporate the most robust positioner in the industry. 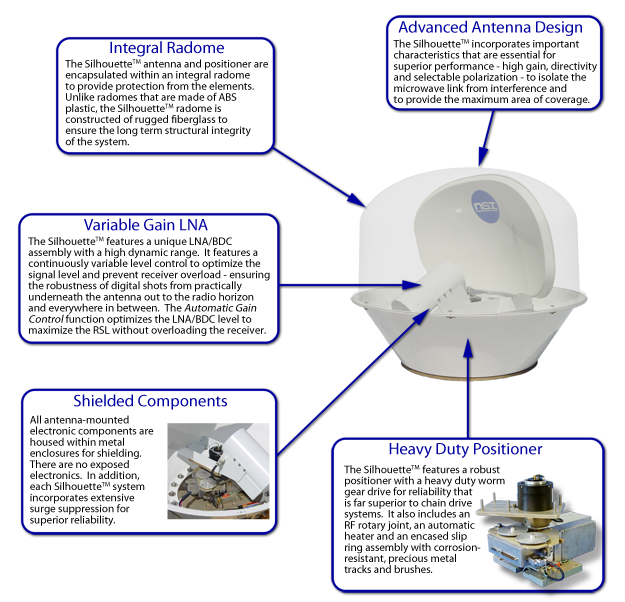 All antenna-mounted electronic components are housed within metal enclosures for shielding. 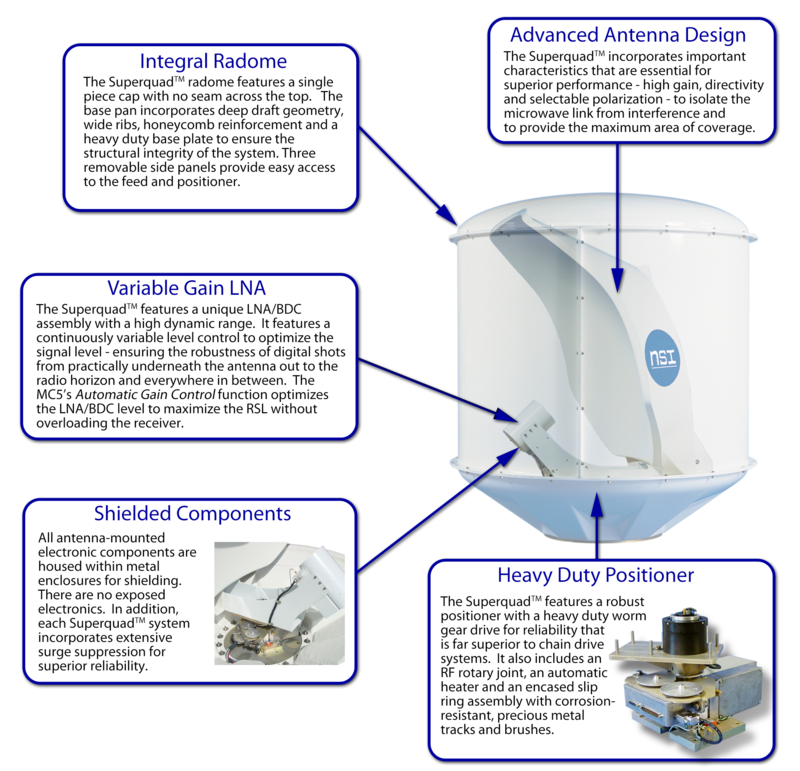 In addition, each system includes an integral, encapsulating radome that protects the antenna and positioner from environmental elements such as wind, rain, ice, snow and ultra violet rays.